Bali is a complex game about battling for control of 4 islands. It has several interesting and interlocking mechanisms in play at the same time, which means that it does take a bit of time to learn to play properly - but it is certainly worth the effort. Bali is about card management at heart, but what makes it stand out, is that your cards are dispersed around the 4 islands and your hand, and you need to play cleverly to keep access to the right cards. 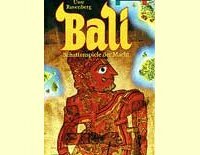 Bali is a rich and rewarding game for those who like a bit more complexity and depth to their games.